Reducing the number of corrosion related hydrocarbon releases and other safety related and environmentally damaging outcomes. Identifying good practices for setting up an optimal corrosion management scheme. Providing an overview of the top corrosion threats to production and processing facilities downstream of wellheads. Improving the safety profile of hydrocarbon installations. 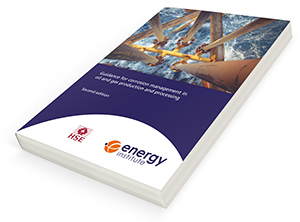 Working through EI's Corrosion Management Committee, oil and gas industry experts have collaborated with the UK regulator, Health and Safety Executive (HSE), to restructure the guidance to align with HSE’s new HSG65 Managing for safety and health model. This second edition incorporates the latest learning and agreed good practice from the global industry, resulting in an extended, robust set of annexes detailing corrosion mechanisms and illustrative case studies to help the practitioner apply agreed good practice in their corrosion management systems and procedures. Building on the previous edition, which was recognised in the HSE KP4: Ageing and Life Extension Programme as a major contribution to the industry’s successes in addressing corrosion issues, this second edition continues to cement the guidance as the de facto standard for managing corrosion in the oil and gas industry. Corrosion has the potential to cost between 3 and 4 % of a company's turnover; use of this guidance presents an opportunity to make significant savings and improve profitability for operators. The 383 page guidance is endorsed by the UK Regulator, HSE.